Legend has it… that King Arthur received Excalibur from Dozmary Pool and defeated Cornwall’s menacing giants. The stories can be traced back to the 11th century. Few places can claim so unusual or romantic a setting. Dozmary, Cornwall’s largest freshwater lake, sits in a high remote hollow where valleys from Bodmin Moor run south to the sea. Legend has it that treasure lies beneath and that Giant Jan Tregeagle was sentenced to empty it with a limpet shell. Inland, on the granite uplands, are desolate stretches of moorland transformed in summer by a blaze of wild heathers and gorse. It is here that widespread archaeological evidences of Iron and Bronze age communities still stand. Among the most ancient and mysterious objects are the quoits, chambered cairns, stone circles, and upright stones. Equally impressive are the courtyard houses of the ancient village of Chysauster and at least 30 superb Iron Age hill forts dating from 500 B.C. 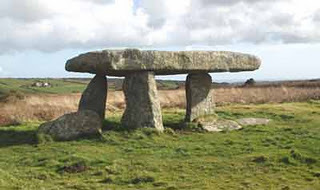 The quoits – ancient burial chambers – consist of several upright stones supporting an enormous horizontal capstone. Originally, these were fancied to be altars of the Druids. Circles of standing stones, such as the Merry Maidens, are said to represent ancient ceremonial meeting places, while ominous holed stones appear to mark entrances to graves. Several holy wells also remain, some with reputed powers, such as at Madron, where users still hang strips of rags on nearby bushes hoping their dreams will come true. Close by, on a windy hillside at Chysauster, lie the evocative remains of an ancient Romano-Cornish village with the oldest identifiable street in England. The ruins of the eight surviving houses – with their terraced gardens and even the remains of sleeping benches – offer an enduring impression of life here 2,000 years ago. Today Chysauster’s only residents are the unusual species of birds that haunt this stretch of coastline and the wild flowers that carpet the ruins. In an area home to more than 2000 years of continuous mining activity, many more silent memorials remain. When foreign competition brought the collapse of tin and copper mining in the late 19th century, mines were abandoned almost overnight. Mining was so important here that the coolapse nearly destroyed Cornwall’s economy. Left to decay, the weathered ruins of failed mines offer a powerful and evocative image of bygone days. With over 47 years experience and over 250 hand-picked and personally inspected properties, Cornish Traditional Cottages www.corncott.com offer self catering holiday accommodation in exceptional locations throughout Cornwall. A spacious bungalow set in a large walled garden with extensive sea views out to Glebe Cliff, the surrounding countryside and less than a mile from the medieval village of Tintagel. A light double bedroom, looks out across wide open farmland, and a large kitchen offers panoramic views of the garden and coastline beyond. The property is set in Treven, one of the seven parishes of Tintagel where there is a wide range of shops & pubs, just a short walk to the coastal footpath, and only a few minutes drive to the beach at Trebarwith Strand. An Edwardian house with views across fields towards the coast and minutes from the beach at Trebarwith Strand. Set in an elevated position, it has a landscaped hillside garden with a seating area above a WWII air raid shelter. The bedrooms all have natural wood floors and views of the countryside. Downstairs the mosaic tiled hallway leads off to a light & airy sitting room with stripped wood floor, period fireplace and a large bay window looking down the valley to Trebarwith. At the rear of the house is a spacious kitchen with a slate floor, long dining table and decorative range. There is also a childrens’ playroom with table football. Trebarwith Strand is a 20 minute walk by footpath and the Mill House Inn is a stroll downhill. 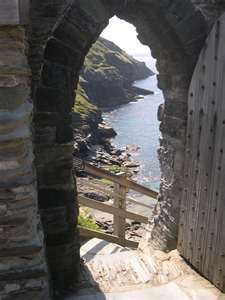 Tintagel boasts shops, pubs & restaurants as well as the mediaeval castle. way to go?… what’s the best way to cope with kids on a long flight? women’s travel insurance sees sisters doin’ it for themselves! I simply loved my last holidays there. I would like to share this accommodation websites as well, the cottages are awesome.